The United States Naval Academy is one of four primary service academies, along with West Point (USMA), United States Air Force Academy (USAFA), and United States Coast Guard Academy (USCG). It is located in Annapolis, Maryland on the banks of the Severn River and on the Chesapeake Bay. 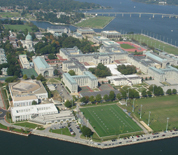 The Naval Academy is an undergraduate institution with Division 1-A sports programs, including Navy Football, Navy Mens and Women's Basketball, Navy Lacrosse, Navy Tennis, and many more. The student body is known as the Brigade of Midshipmen, and each of the four classes consists of approximately 1,000 students for a total of 4,000 Midshipmen. Naval Academy Midshipmen undergo a rigorous Plebe Summer prior to their Freshman (Plebe) year, during which they must pass constant physical and mental challenges. The class of 2008 is rumored to have experienced the last "real" Plebe Summer, and we all still cheer in Solidarity to "Free 19!"